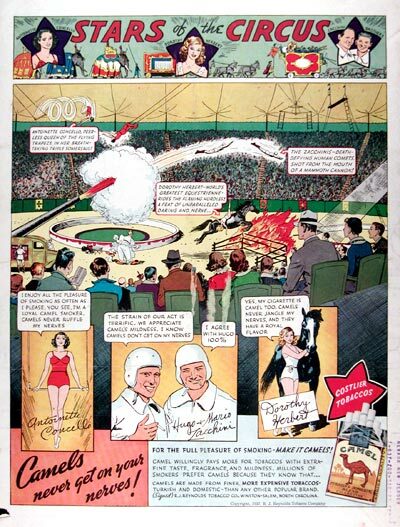 1937 Camel Cigarettes Circus original vintage advertisement. Star of the Circus featuring Antoinette Concello, Queen of the Flying Trapeze, Hugo & Mario Zacchini, Death Defying Human Comets and Dorothy Herbert, World's Greatest Equestrienne Rider, defying flaming hurdles. Good: Ink stamp lower right, page tear lower left corner, page wear mid center.